Beautifully engraved certificate from the Germantown Passenger Rail Way Company issued in 1894-1896. 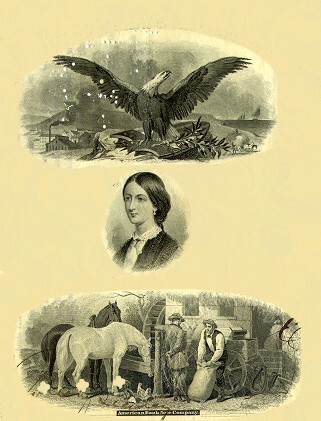 This historic document was printed by the American Banknote Company and has an ornate border around it with vignettes of Florence Nightingale , an eagle perched upon a shield with its wings spread out, and men with horses in fron of a old store. This item is hand signed by the company�s president and treasurer and is over 104 years old. (1820-1910), British nurse, hospital reformer, and humanitarian. Born in Florence, Italy, on May 12, 1820, Nightingale was raised mostly in Derbyshire, England, and received a thorough classical education from her father. In 1849 she went abroad to study the European hospital system, and in 1850 she began training in nursing at the Institute of Saint Vincent de Paul in Alexandria, Egypt. She subsequently studied at the Institute for Protestant Deaconesses at Kaiserswerth, Germany. In 1853 she became superintendent of the Hospital for Invalid Gentlewomen in London. After the Crimean War broke out in 1854, Nightingale, stirred by reports of the primitive sanitation methods and grossly inadequate nursing facilities at the large British barracks-hospital at �sk�dar (now part of Istanbul, Turkey), dispatched a letter to the British secretary of war, volunteering her services in Crimea. At the same time, unaware of her action, the minister of war proposed that she assume direction of all nursing operations at the war front. She set out for �sk�dar accompanied by 38 nurses. Under Nightingale's supervision, efficient nursing departments were established at �sk�dar and later at Balaklava in Crimea. Through her tireless efforts the mortality rate among the sick and the wounded was greatly reduced. At the close of the war in 1860, with a fund raised in tribute to her services, Nightingale founded the Nightingale School and Home for Nurses at Saint Thomas's Hospital in London. The opening of this school marked the beginning of professional education in nursing. Florence Nightingale's contributions to the evolution of nursing as a profession were invaluable. Before she undertook her reforms, nurses were largely untrained personnel who considered their job a menial chore; through her efforts the stature of nursing was raised to a medical profession with high standards of education and important responsibilities. She received many honors from foreign governments and in 1907 became the first woman to receive the British Order of Merit. She died in London on August 13, 1910. In 1915 the Crimean Monument in Waterloo Place, London, was erected in her honor. Her writings include Notes on Nursing (1860), the first textbook for nurses, which was translated into many languages. Among her other writings are Notes on Hospitals (1859) and Notes on Nursing for the Labouring Classes (1861). Application having been made to the Legislature for a charter for a railroad company to ply between Philadelphia and Norristown (See stock certificate for this railroad), an act was passed on February 17, 1831, incorporating the Philadelphia, Germantown and Norristown railroad. Eight thousand shares at fifty dollars each were authorized to be issued. the stock was quickly over-subscribed. Rails were laid to Germantown and the road was formally opened on June 6, 1832. The first car drawn by horses left the depot, corner Ninth and Green streets, at 12:15 P.M. arriving in Germantown three-quarters of an hour later, which was considered great speed. Cars left the depot at intervals of two hours. Fare twenty-five cents. For six months horse-power was used. On November 23, 1832, a great novelty was introduced in the shape of a locomotive engine, which had been built by Matthias W. Baldwin. the engine ran beyond the township line at a speed of about twenty-eight miles per hour. On the following day the locomotive drew four cars loaded with passengers to Germantown, a distance of six mile, in twenty-eight minutes. by act of March 1, 1833, the company was authorized to build a single track on Ninth Street from Spring Garden Street to Vine Street. In April, 1829, the Delaware and Schuylkill Railroad was incorporated. This railroad was finished and opened on April 23, 1834. The route of same was on Willow Street, from the Delaware River westward to Broad Street to Pennsylvania Avenue, to the Schuylkill river bridge at Peters' Island, there to connect with the Columbia or Pennsylvania Railroad. It was practically the first passenger railroad within the city. The cars were drawn by horses. It was announced that on this date pleasure cars would run at stated periods from the Third Street Hall, northwest corner of third and Willow Streets. This building was erected to serve a dual purpose-hotel and railroad depot. Philadelphia and Trenton Railroad was incorporate February 23, 1832, with a capital of six hundred thousand dollars. The depot was established on a lot of ground between Frankford Road and Front Street, north of Harrison (now Palmer Street). The office of the company to continue east at Third Street Hall, Third and Willow Streets, On March 23, 1839, another act of assembly was passed authorized the company to continue its tracks from the depot in Kensington along the Frankford Road and Maiden Street for one year, until another railroad could be conveniently constructed upon another route from the Kensington depot to the depot at Third and Willow Streets. The Philadelphia and Reading Railroad Company's charter was passed April 4, 1833. The original object of the company was to construct a railroad from Peter's Island, four miles from Philadelphia, where connection was made with the Philadelphia and Columbia Railroad to Reading, a distance of fifty-four miles. Portions of the road were opened for travel in 1835. The port Richmond branch, five miles long, from Port Richmond branch, five miles long, from Port Richmond on the Delaware to the Falls of Schuylkill was completed in 1842. After the State Railroad was relocated, in 1850, the old line from Thirteenth and Callowhill Streets, Philadelphia, to Peters' Island, was purchased by the Philadelphia and Reading Railroad Company. A subsidiary company was The Laurel Run Improvement Company, chartered May 18, 1871, and changed by act of December 12, 1871, to the Philadelphia and Reading Coal and Iron Company. North Pennsylvania Railroad. In 1851 considerable interest was manifest for the construction of a railroad connecting Philadelphia with the Lehigh coal region. This resulted in the incorporation on April 8, 1852, of the Philadelphia, Easton and Water Gap Railroad Company. The title of the company was changed by act of April 18, 1853, to the North Pennsylvania Railroad Company. It was formally opened Monday, July 2, 1855, by an excursion from the Cohoquinoque Station, at Front and Willow Streets, to Fort Washington. The road was opened through to Bethlehem in 1857. The passenger depot remained at Front and Willow Streets until 1864, when it was removed to Germantown Road, above Thompson Street (later used as the Milk Depot). Subsequently s depot was built at Third and Berks Streets. The North Pennsylvania Railroad is now a part of the Reading Railway system. The Pennsylvania Railroad. This road grew out of the mixed railroad and canal system constructed by the State between Philadelphia and Pittsburgh. On the 13th of April, 1846, an act to incorporate the Pennsylvania Railroad was passed. The capital stock of the company was fixed at $7,500,000 with the privilege of increasing same to $10,000,000. During the year of 1847 the city of Philadelphia subscribed $2,500,000 to the stock of the company. The next year the county of Allegheny subscribed $1,000,000. Much of the success attending the Pennsylvania Railroad is due to the almost military rigidity with which its workings were arranged under the inspiration of its chief engineer and first president, J. Edgar Thompson. For Twenty years he marked out and reiterated in his annual reports the plan for the future of the Pennsylvania Railroad, and he never deviated from that plan, pursuing it persistently, patiently and faithfully. TRACTION NOTES A stage coach drawn by two horses was the beginning of Philadelphia's present transit system. City Councils as early as 1855 had appointed a special committee to report on street railways. They were then in operation in New York and Boston. The committee favored the innovation. Meanwhile, capitalists were at work in Harrisburg endeavoring to secure a charter for a proposed railway line, to be operated by horse power, on Fifth and Sixth Streets. Instantly there were intimations of corruption. The most violent opposition to the project was aroused. Mass-meetings were held in protest. Fiery orators harangued the crowds. Unique objections were urged against Philadelphia's premier horse-car line. A protest signed by 1,200 persons living on Fifth and Sixth Streets was presented to the Legislature brushed all these complaints aside and granted the charter prayed for. Timeline 1858 In May, 1857, the Philadelphia and Delaware River Railroad was chartered, giving the right to build a road from Philadelphia to Frankford, upon which cars drawn by horses could be used. Horse cars were in use from January 8, 1858, to November 17, 1863, when the Frankford and Southwark Passenger Railway introduced "dummies" which ran from the depot, Fourth and Berks Streets, to Frankford. The first was called the Alpha, and the second the Sea Gull. The old depot at Forth and Berks Streets was abandoned in January, 1872, the company having erected a new depot at Kensington Avenue and Cumberland Street. 1859 > March 24. Chestnut and Walnut Street Railway, act of legislature, approved by Council. Company agreed to pay $100,000 towards bridge over the Schuylkill. May 30. Sunday cars run on Green and Coates Street Railway. June 23. Arch Street Railway to Fairmount commences operation. July 17. Green and Coates Street Railway cars stopped running on Sunday, by order of the Mayor. July 21-23. Sunday car case argument before Supreme Court. July 23. Indignation meeting in Independence Square on Sunday cars. October 24. Chestnut and Walnut Street cars commence running to Twenty-second Street. 1860 May 24. Fire, Richmond and Schuylkill River Railway (Girard Avenue Line--Palmer to Thirty-first Street.) Depot, Girard Avenue above Twenty-sixth Street. 1865 February 1. Passenger railway fares raised to 7 cents. 1866 May 13. Chestnut and Walnut Street Railway commences west of new Chestnut Street bridge. December 30. Depot of Second and Third Street Railway destroyed by fire. 1877 March 21. Trial of steam passenger cars on the West Philadelphia (Market Street) P. R. W. Co. Seven dummy engines were in use. September 22. Great excitement among brokers and bankers in consequence of the discovery of an over-issue of stock of the Market Street Railroad Company, which it was subsequently ascertained amounted to about 11,000 shares. 1878 April 13. Steam dummy cars, after a year's trial by the Market Street Railway Company, withdrawn from service. Too expensive. 1879 July 31. Seventeenth and Nineteenth Streets Passengers Railway formally opened as a portion of the Continental Passenger Railway. December 4. The controlling interest in the Union Passenger Railway Company, 12,600 shares, purchased by a combination, principally composed of officers and stockholders of the Continental Passenger Railway Company, at $100.00 a share. (This was the nucleus to the formation of combinations, eventually forming the Philadelphia Rapid Transit Company). Ridge Avenue Passenger Railway Company commenced to sell five tickets for the conveyance of passengers for 25 cents. Single fares remained at 6 cents. 1880 March 25. Stable of the Richmond branch of the Union Passenger Railway Company, Thompson and Norris Streets, burned. Loss, $20,000. 1881 June 24. Fifteen thousand three hundred and nine shares of stock in the Germantown City Passenger Railway Company (Fourth and Eighth Streets) being a controlling interest, sold to a syndicate represented by the People's (Callowhill Street) Railway Company. July 27. The Lombard and South Street Passenger Railway leased to the West End and Angora Passenger Railway Company. October 18. 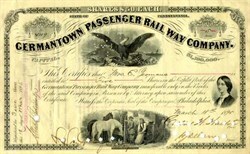 By vote of 18,463 shares in favor, to 3,501 against the proposition, the stockholders of Germantown Passenger Railway (Fourth and Eighth Streets) resolved to lease their road and franchises to the People's Passenger Railway (Callowhill Street) for 999 years at a maximum rental of $4.50 per share, or nine per cent, on the capital stock. 1882 March 18. Directors of the Union Passenger Railway Company resolved to adopt the cable-motor system for propulsion of their cars on Columbia Avenue branch from Twenty-third Street to East Park entrance. June 6. Spruce and Pine Streets Passenger Railway cars commenced to run for five-cent fares to Fairmount and Gray's Ferry, from Delaware Avenue. June 20. Lombard and South Street, and Spruce and Pine Streets Passenger Railway Companies (five-cent fare roads) began a system of exchanges for six cents over both roads. July 26. Stockholders of the West End Passenger Railway Company, by a vote of over 6,000 shares to 3,000 agree to consolidate "Tinkle, little bell, when you'll come no one can tell!" Remember the old horse car? Apathetic in motion and rich in atmosphere, for decades these snappy roadsters rambled tediously over their tortuous tracks, pro-pelled by decadent equine energy and guided by hands that spared not the lash last they hold a slack rein. Remember their aromatic summer torridity? Remember the four and six horse hitches on snowy winter nights-the end-less blockades-the exciting moments when the driver would run the car off the track and then bounce it boldly on again? And last, but far from least, remember the straw that "warmed" your feet in winter, and by its absence, invariably on the day of April, it reminded you that it was April Fool's Day? In the "good old days," a few hours one way or the other Meant nothing. Now the cry is "Step on it!" Their company with Lombard and South Streets Passenger Railway Company. October 4. The President and Directors of the People's Passenger Railway Company (Callowhill Street) which also controlled the Germantown, Fourth and Eighth, Girard Avenue and Green and Coates Street lines resigned, and Charles J. Harrah, who had obtained the controlling interest of the stock, was elected President, with a new board of managers. 1883 April 7. Cable-motor branch of Union Passenger Railway, Columbia Avenue, from Twenty-third Street to the Park, commenced regular operations. July 23. The direction taken by the cars on the Thirteenth and Fifteenth Streets Passenger Railway reversed, running up Thirteenth Street and down Fifteenth. September 19. Workmen commenced laying the cable road of the Union Passenger Railway Company on Columbia Avenue east of Twenty-third Street. 1884 May 12. Stockholders of West Philadelphia Passenger Railway Company ratified a lease of their road to the Philadelphia Traction Company for nine hundred and ninety-nine years, on a contract to pay each stockholder ten dollars per share annually, in half-yearly payments. June 30. Stockholders of the Union Passenger Company at a special meeting agreed to lease their road to Philadelphia Traction Company for nine hundred and ninety years. November 24. New line of People's Passenger Railway Company, via Susquehanna Avenue from Eighth To Twenty-second Street, and by way of Islington Lane (now Diamond Street) and Twenty-third to Norris Street and east on Norris to Germantown Avenue, opened for travel. January 26. Cable passenger railway of the Philadelphia Traction Company went into operation on Columbia Avenue and Master Street. June 13. New cable of the Traction Company on Columbia Ave, Between Twenty-third Street and East Park, put into operation. January 16. A majority of the stock in the People's Passenger Railway (Callowhill Street) Company, which was the lessee of the Germantown, Fourth and Eighth, Green and Coates, Girard Avenue and Norris and Susquehanna roads, sold to a syndicate composed principally of stockholders of the Lombard and South Streets P. R. W. Company, and reorganized by the latter. March 3. Fire at the stable of People's Passenger R. W. Company, at Eighth and Dauphin Streets. Loss, $5,000. It contained 128 horses, which were rescued. April 2. The traction company Withdrew the night cars running on the Richmond, Columbia Avenue, Seventeenth and Nineteenth Streets, and Chestnut and Walnut Streets branches. April 14. New line of night cars commenced on the Hestonville, Mantua and Fairmount (Arch Street) Railway from Second and Arch Streets to Forty-third Street and Lancaster Avenue. Night cars resumed running on the railways formerly furnished with that service by the traction company. October 10. Cable cars commenced running on the Columbia Avenue branch of the Union Passenger Railway. 1887 February 25. The Philadelphia Traction Company gave notice that on and after the first of April the fare on all lines controlled by the company would be five cents for a single ride, with privilege of transfer at certain points and additional charge of two cents for transfer at other points formerly freely given. March 1. The Traction Company announced a reduction of fare to five cents, and transfers without extra charge. March 4. The People's Passenger Railway Company Reduced fare for all passengers, except infants in arms, to five cents, including all exiting transfer privileges. March 7. The Traction Company and all the other passenger railway companies commenced carrying passengers at five cent fares. Exchange tickets between other roads than the Traction, Ridge Avenue and People's Passenger Railway systems, seven cents. March 21. Stable and hayloft of the thirteenth and Fifteenth Streets Passenger Railway Company, at Carlisle and Cumberland Streets, burned. Loss, $8,000. August 4. An electric car built by Wm. Wharton, Jr., & Co., and run with the electric power and energy of storage batteries on the car, was run from Gray's Ferry over the Spruce and Pine Streets Passenger Railway to Dock and Walnut Streets with passengers, making two trips. November 2. Lease of the Lombard and South Streets Passenger Railway lines by the People's Passenger Railway Company rescinded. 1888 January 10. Cable cars of the Traction Company began running on Seventh and Ninth Streets between Columbia Avenue and Mckean Street. June 14. New system of attaching the cars of the Fairmount branch of the Philadelphia Traction Company to the cable motor cars at Franklin and Wallace Streets went into effect. August 10. Eight cent exchanges inaugurated on the Traction Company's system. 1890 March 1. Cars began running on the Catharine and Bainbridge Streets branch of the Philadelphia Traction Company. Coaches of the Omnibus Company General began running on Broad Street. May 1. Lehigh Avenue electric cars began regular service with six cars. July 2. The Fairmount Park Motor Company formed to build and operate a gravity railroad in the Park. 1892 April 1. The Frankford and Southwark (Fifth and Sixth) Passenger Railway Company took possession of the Tenth and Eleventh (Citizens Line) Passenger Railway Company. August 15. The construction of the Traction Company's first electric trolley line was commenced on Catharine and Bainbridge Streets. August 18. Stockholders of the Ridge Avenue Passenger Railway Company leased the line to the Traction Company, the lease to go into effect September 1st. December 14. First trolley cars operated in the city on Catharine and Bainbridge Streets. 1894 August 12. Trolley cars of the People's Traction Company began running to Mt. Airy. November 9. The People's Passenger Railway Company reduced the fare to Germantown from ten to five cents. December 9. The agreement between the People's and Electric Traction Companies, under which free transfers are made at nearly every point where lines intersect, went into effect. 1895 July 22. Leading stockholders of the People's and Electric and the Philadelphia Traction Companies agreed to consolidate and form a company with a capital of 30,000,000, a charter for which was afterwards obtained and consolidation effected, dating from October first. October 6. The lease of the Philadelphia Traction Company to the Union Traction Company was signed, and the consolidation of the Philadelphia, People's and Electric Traction systems was consummated, the Union Traction Company taking control. John R. Beetem, General Manager of the People's Traction was appointed General Manager of the Union Traction Company. October 16. Directors of the Union Traction Company decided to fix these rate of fares on all lines at five cents for a straight ride, except to certain suburban points, with eight cents for exchange tickets, abolishing free transfers. December 17. The strike declared against the Union Traction Company by the Amalgamated Association of Street Railway Employees was inaugurated. Cars were run during the morning on most of the company's lines, especially the lines of the People's division, where almost the regular service was maintained. Disorder and rioting prevailed. December 25. There was a tie-up on the Girard Avenue line. Cars were attacked by rioters. Ten men charged with inciting to riot were arrested at Second Street and Girard Avenue. 1896 November 10. The Fairmount Park trolley road formally opened. December 20. George D. Widener Widener elected President of the Philadelphia Traction Company to succeed the late D. W. Dickson. 1997 March 3. The power house of the Union Traction Company at Thirteenth and Mount Vernon Streets was destroyed by fire. Loss, $400,000. Two killed and about a score injured. 1898 February 1. The Union Traction Company took possession of the property of the Hestonville, Mantua and Fairmount Passenger Railway Company. 1899 June 19. Eight or ten masked men entered the office of the Fairmount Park Transportation Company, near Belmont, after the cars has ceased running for the night, and five other employees, forced the safe and abstracted $3,355.57. PASSENGER RAILWAYS, 1876 Single fare 7 cents, 4 tickets 25 cents. Children under ten years, 4 cents. Citizens P.R. W. Co. Tenth and Eleventh Streets. Down Tenth Street to Reed Street, to Eleventh Street, to depot, corner Montgomery Avenue. Mifflin Street Branch. Down Tenth Street, up Twelfth Street, Wharton Street to Mifflin Street. Continental P. R. W. Co. from Montgomery Avenue and Eighteenth Street, up Montgomery Avenue and Eighteenth Street, up Montgomery Avenue, to Twentieth Street, to Federal Street, to Eighteenth Street, to Francis Street, to Perkiomen Street, to Vineyard Street, to Ridge Avenue, to Eighteenth Street, to Montgomery Avenue. Empire P. R. W. Co. Twelfth and Sixteenth Streets. Down Twelfth Street to Wharton Street, to Seventeenth Street, to Carpenter Street, to Sixteenth Street, up Sixteenth Street, to Montgomery Avenue, to depot, corner Twelfth Street. Frankford And SouthWark P. R. W. Co. Fifth and Sixth Streets. Down Kensington Avenue to Front Street, to Berks Street, to Sixth Street, to Jackson Street, to Fifth Street, up Fifth Street to Berks, to Front Street, to Kensington Avenue, to depot, corner Cumberland Street. Lehigh Avenue and Powell Street Branch. Up Kensington Avenue to Lehigh Avenue, to Sixth Street to Powell Street, to Fifth Street, up Fifth Street to Lehigh Avenue, to Kensington Avenue, to depot. Frankford Steam (dummy) Line Branch. Up Kensington Avenue to Adams Street, to Main Street, to Margaretta Street and return over same route. Germantown P. R. W. Co. Fourth and Eighth Streets. Down Dauphin Street to Germantown Avenue, to Fourth Street, to Dickinson Street, to Eighth Street, up Eighth Street to Columbia Avenue, to seventh Street, to depot, Dauphin Street. Each alternate car turning up Walnut Street to Eighth Street. Germantown Branch. From Dauphin Street up Eighth street to Germantown Avenue, to Germantown and return. Girard Avenue Branch. From Twenty-sixth Street on Girard Avenue to Palmer Street, to Beach Street, to Beach Street, to Shackamaxon Street, to Girard Avenue, to Elm avenue (now Parkside Avenue) to Belmont, returning over same route. Green & Coates P. R. W. Co. From entrance of Park, down Fairmount Avenue to Twenty-second Street, to Green Street, to Fourth Street, to Dickinson Street, to Eighth Street, up Eighth Street to Fairmount Avenue to Park. Each alternate car turning into Walnut Street to Eighth Street. Delaware River Branch (one horse). Up Beach Street to Fairmount Avenue, to Eighth Street, returning down Fairmount Avenue to Fourth Street, to Green Street, to Beach Street. Hestonville, Mantua & Fairmount P.R.W. Co. Down Lancaster Avenue to Haverford Avenue, to lower deck of Fairmount Bridge, to Callowhill, to Twenty-second Street, to Race Street, to Second Street, to Walnut Street, to Dock Street, to Third Street, to Vine Street, to Twenty-third Street, to Spring Garden Street, to upper deck of Fairmount Bridge, to Spring Garden Street, to Lancaster Avenue, to Belmont Avenue depot, forty-third Street and Lancaster Avenue. Hestonville Branch. Out Lancaster Avenue to Fifty-second Street and return over same route. Arch Street Branch. Down Hamilton Street to Twenty-fifth Street, to Spring Garden Street, to Twentieth Street, to Arch Street, to Second Street, returning up Arch Street to Twenty-first Street, to Callowhill Street, to depot. Lombard & South Streets Branch. Down Lombard street to Front Street, to Dock Street, to Delaware Avenue, returning up Dock Street, to Front Street, to South Street, to depot, corner Twenty-fifth Street and South Street. Southern Branch. From depot, Thirteenth Street and Snyder Avenue, down Snyder Avenue, to Twelfth Street, to Dickinson Street, to Eighth Street, to Christian Street, to Fifth Street, to Lombard Street, to Fourth Street, to South Street, to Passyunk Avenue, to Mifflin Street, to Twelfth Street, to Snyder Avenue, to Broad Street. Manayunk & Roxborough Inclined Plane P.R.W. Co. Ridge Avenue, from Barren Hill to Wissahickon Station, Reading R.R., and return. Philadelphia City P.R. Co. Chestnut and Walnut Streets, from depot to Forty-second Street, to Chestnut Street, to Forty-second Street. Fairmount Park Branch. Down Belmont Avenue to Lancaster Avenue, to Thirty-second Street, to Chestnut Street, to Thirty-second Street, to Lancaster Avenue, to Belmont Avenue. Darby Branch. Down Darby Road to Woodland Avenue, to Chestnut Street, to Front, to Walnut, to Twenty-second Street, to Chestnut Street, to Woodland Avenue, to Darby Road. Mount Moriah Branch. Same as Darby Branch, as far as Mount Moriah. Philadelphia & Grays Ferry P.R.W. Co. Spruce and Pine Streets. Grays Ferry Branch. Third and Dock Street, to Second Street, to Pine street, to Twenty-third Street, to Grays Ferry Road, to Grays Ferry Bridge, return by Grays Ferry Road to Christian Street, to Twenty-second Street, to Spruce Street, to Third Street, to Dock Street. Fairmount Park Branch. Same as above to Twenty-third Street, to Callowhill Street, to Twenty-fifth Street, to Green Street, entrance to Park. People's P.R.W. Co. Callowhill Street. Park entrance to Biddle Street, to Twenty-fourth Street, to Callowhill Street, to Front Street, to Vine Street, to Delaware Avenue. Returning up Vine Street to York Avenue, to Callowhill Street, to Front Street, to Vine Street, to Delaware Avenue. Returning up Arch Street to Ninth Street, to Ridge Avenue to depot, Thirty-second and Ridge Avenue. Manayunk Branch. Up Ridge Avenue to Paul Street, to Main Street, to Arrott Street. Returning over same route. North Penn Branch. Down Frankford Avenue to Huntingdon Street, to Coral street, to Cumberland Street, to Second Street, to Dock Street, to Third Street, to Germantown Avenue, to Oxford Street, to Third Street, to Berks Street, to Second Street, to York Street to Coral Street, to Cumberland Street, to Amber Street, to depot. Richmond Branch. Up Lehigh Avenue to Richmond Street, to Frankford Avenue, to Manderson Street, to Frankford Avenue, to Girard Avenue, to Norris Street, to Richmond Street, to Lehigh Avenue. Bridesburg Branch. Up Lehigh Avenue to Richmond Street, to Bridge Street, to Washington Street, to Washington Street. Returning by same route. Seventeenth & Nineteenth Streets P.R.W. Co. Up Nineteenth Street to Norris Street, to Seventeenth Street, to Ridge Avenue, to Francis Street, to Seventeenth Street, to Carpenter Street, to Nineteenth Street, to depot at Master Street. Thirteenth & Fifteenth Streets P.R.W. Co. Up Carpenter Street to Fifteenth Street, to Master Street, to Ridge Avenue, to Columbia Avenue, to Thirteenth Street, to Carpenter Street, to Broad Street, to depot, above Washington Avenue. Norris Street Branch. Up Carpenter Street to Fifteenth Street, to Norris Street, to Thirteenth Street, to Carpenter Street, to Broad Street to Wolf Street, and returning by same route. North Broad Street Branch. From Norris Street up Broad Street to Cambria Street. Returning over same route. Union P.R.W. Co. Down Brown Street to Twenty-third Street, to Wallace Street, to Franklin Street, to Race Street, to Seventh Street, to Federal Street, to Front Street, to Wharton Street, to Ninth Street, to Spring Garden Street, to Twenty-third Street, to Brown Street, to Park entrance. Richmond Branch. Down Thompson Street to Marlborough Street, to Belgrade Street, to Frankford Avenue, to Master Street, to Franklin Street, to Race Street. to Seventh Street, to Passyunk Avenue, to Ellsworth Street, to Broad Street, up to Christian Street, to Ninth Street, to Spring Garden Street, to Seventh Street, to Oxford Street, to Fourth Street, to Norris Street, to Memphis Street, to York Street, to Thompson Street, to depot, corner Norris Street. Columbia Avenue Branch. Down Columbia Avenue to Franklin Street, to Race Street, to Seventh Street, to Market Street, to Front Street. Returning, up Market Street to Ninth Street, to Spring Garden Street, to Seventh Street, to Columbia Avenue, to depot at Twenty-third Street. Spring Garden and Popular Street Branch. (One horse.) Down Brown Street to Twenty-third, to Wallace, to Twenty-second, to Spring Garden Street, to Seventh Street, to Popular Street, to Twenty-ninth Street, to Park entrance. Cedar Street Branch. From York Street up Cedar Street to Somerset Street, to Richmond Street. Returning by same route. Christian Street Branch. Up McKean Street to Ninth Street, to Ellsworth Street, to Twenty-third Street, to Christian Street, to Seventh Street, to depot at corner McKean Street. Jefferson Street Branch. From Twenty-fourth Street down Jefferson Street, to Franklin Street, to Thompson Street, to Front Street, to Columbia Avenue, to Franklin Street, to Master Street, to Twenty-fourth Street, to Columbia Avenue, to depot at Twenty-third Street. West End P.R.W. CO. From Woodlands Cemetery on Baltimore Avenue, to Fortieth Street, to Locust Street, to Thirty-sixth Street, to Powelton Avenue, to Thirty-fifth Street, to Zoological Garden. Returning on Thirty-fifth Street to Eadline Street, to Thirty-third Street, to Walnut Street, to Thirty-sixth Street, to Locust Street, to Thirty-eighth Street, to Woodland Avenue, to Baltimore Avenue. Fairmount Park Line. From South Street Bridge, to Thirty-fourth and Spruce Streets, on Spruce Street to Thirty-eighth Street, to Lancaster Avenue, to Forty-first Street to Elm Avenue, to George's Hill. Returning to Fortieth Street, to Locust Street, to Thirty-sixth Street, to Spruce Street. West Philadelphia P.R.W. CO. Market Street from depot, Forty-first and Haverford Avenue, down Forty-first Street to Market, to Front. Returning over same route. Haddington Branch. Out Market Street, from Front Street, to Forty-first Street, to Haverford Avenue, to Sixty-seventh Street. Returning to Sixty-fifth Street, to Vine Street, to Haverford Avenue, to Forty-first Street, to Market Street, to Front Street.